You've likely seen the television advertisement's where the likes of Jorgie Porter, Nicole Scherzinger, Hayden Panettiere and even Adam Levine have boasted the miracle works of Proactiv + treatments and how it 'transformed' their lives - so when I ordered from ASOS a few weeks ago and got given a voucher to try a 30 day kit for £20 (plus p+p) I thought: why not give it a try? I will tell you all now, I was not eagerly awaiting this kit to come though my door to be my skin saviour, I honestly didn't want to go into this with the highest hopes because as a teen I suffered with my skin - I still do now(!!) - and I had it in my mind that the only thing that can really give you fully clear skin is prescribed treatment (which is mainly why I take the pill). But after three weeks of using it my skin really has improved! I've been genuinely shocked with it. I use the three-step kit twice a day and it really has changed my skin. The three-step kit contains the Skin Smoothing Exfoliator - which I use with the facial brush - a Pore Targeting Treatment toner and a Complexion Perfecting Hydrator moisturiser. With the toner you only need a very small amount a it goes a long way - it's an odd sensation as it makes your skin feel a bit tight. Once the toner is absorbed fully the moisturiser leaves skin feeling smooth and soft. My only criticism is the moisturiser is heavier than I would typically use day to day and once I wake up in the morning my skin can feel almost oily - it's hard to describe, my skin doesn't feel greasy, but it does feel like it needs cleansed. Over all I've seen a huge improvement with my skin - I've obviously had the odd blemish when my hormones have changed within the month, but using the products had made it go down quicker than usual. The mask I got free doesn't feel like your typical face mask that goes hard or drys, it feels more like the Liz Earle Hot cloth Treatment, as a good comparison - and even with it's slight clinical smell it leaves skin feeling lovely and refreshed. So, would I recommend Proactiv+? I think I would, especially for those who are at the end of their tether with skin treatments for adult acne or frequent blemishes. I wouldn't say it's 'transformed my life' - but then again, unlike those celebs I've not been paid a few grand to do so - but I will say I've seen a huge positive improvement with skin over the last month. Possibly, the price puts me off, as to repurchase they are a bit pricey. But the pay monthly option is tempting and it would take off any pressure or stress of going out to but new products when the others run out. 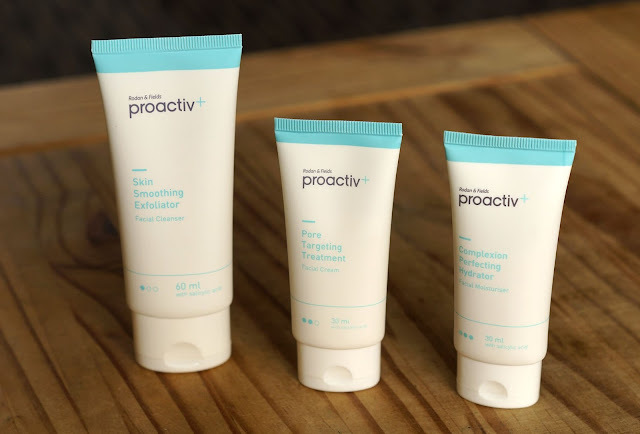 I would love to know if any of you out there have jumped on the Proactiv+ bandwagon, or if you have any other similar kits or solutions you'd recommend, get in touch or comment below!